Lots of movie theaters offer $1 or even free movies in the mornings during the summer. Every Theater is different, so you will need to just search you local theater for more information. When we go I take a couple of quite toys for Little Lady because she's still too young to sit through a full length movie. The nice thing about going to these showings is almost every other mother there has a toddler, so it's not a big deal if someone has to make a potty trip in the middle of the movie or is more interested in dancing to the music than sitting still. 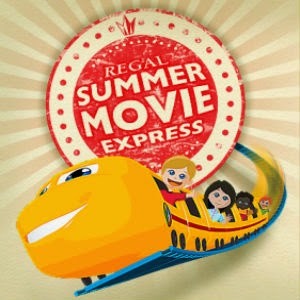 One of the national chains, Regal, has a lots of options this summer. Or check out Fandango for more option. You can usually spot the free movies by their early showing times and they are usually movies that are on DVD by now. What kid dosen't like to play on a playground? You can go to a local park, school, church, or even McDonald's. Sunscreen and bug-spray will be about your only expense. Pack a picnic before you go to the park/playground and you can have a whole day of fun. You can make it as simple as PB&J sandwiches or grill out. Some parks have grills already there you'll just need to bring the charcoal and food. Bubee played his first game of bowling when he was 3. They had a special rack for him to push his bowlingball down. While you may not want to bowl every single day this summer, kidsbowlfree.com dose offer you that option with one free game per child per day. AMF offers 3 free kid's games every day and you can purchase a summer pass for up to 4 adults to bowl all summer. Most Public Libraries have fun story times, craft projects and other community activities. Did you know that August 25th is National Park Service Birthday and you can go for free? If you don't want to wait till then, you can still visit the 268 National Parks that are free every day of the year! 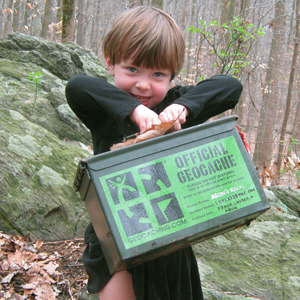 Geocaching became pretty popular a few years back. My brother and I have actually placed a couple of Geoches around our local area. It's a lot of fun. If you don't know what Geocaching is, per the official website: Geocaching is a real-world, outdoor treasure hunting game using GPS-enabled devices. Participants navigate to a specific set of GPS coordinates and then attempt to find the geocache (container) hidden at that location. There's nothing like the rush of finding a hidden treasure! Lowes - Build and Grow clinics are lots of fun! Each child gets to build a wooden project and gets a free apron, goggles. patch and more! Home Depot - The first Saturday of each month Home Depot offers a FREE hands-on workshops; designed for children ages 5 - 12. All kid get to keep their craft, receive a FREE certificate of achievement, a Workshop Apron, and a commemorative pin. Ace Hardware - A lot of the Ace Hardware stores offer a monthly kid's club similar to other hardware stores. You will need to contact your local store directly as each one varies. Bass Pro Shop - offers Family Workshops all summer. Pottery Barn Kids - Curious George, Spider-Man and Captain America are all scheduled to make appearances this summer. There's also a weekly story time to enjoy. Check out your local store's events. Apple Store -At Apple Camp, kids ages 8-12 learn how to shoot their own footage, create an original song in GarageBand on an iPad, and put it all together in iMovie on a Mac. This free workshop, held at the Apple Store, spans three days and ends with campers debuting their masterpieces at the Apple Camp Film Festival. Microsoft Store - Registration is open for free weekly in-store camps. Camps are broken up into two age groups for Jr. Designers (recommended for ages 8-10) and Designers (recommended for ages 11-13), so choose the camp that fits your student’s interest and sign up today. Michael's Craft Store - Let your kids explore their creativity while you shop! Just $2 per child ages 3 and up. All supplies included. By the third day of summer my kids are kind of tiered of simple lunches (PB&J anyone?). I just don't have the funds to eat out very often. However with kidsmealdeals.com and mykidseatfree.com I can take the kiddos out for just the cost of my meal! Not to get on a soap box, but some kids these days need to be reminded the world dose not revolve around them. My kids included! That being said, volunteering is a great way for families to spend time together, give back to the community, and grow together! It can also be surprisingly fun. The kids like animals? Try volunteering at an animal shelter. VolunteerMatch.org can fit your family with the perfect place to volunteer. Bank of America offers free admission to over 150 museums. Also if you just Google "Free Museums" there are a lot of links to local museums (Chicago, LA, and NYC have a lot) that offer free days. Bookadventure.com is an amazing program. Book Adventure is a fun, free way to motivate your child to read! 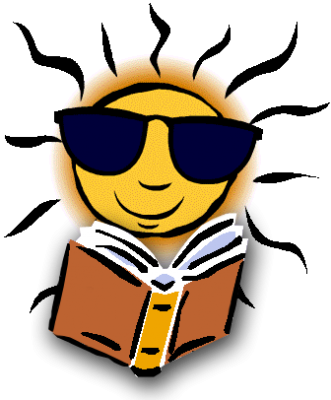 Kids in grades K-8 can search for books, read them offline, come back to quiz on what they’ve read, and earn prizes for their reading success. With Barns and Nobles Summer Reading Program kids can earn a free book just by reading any 8 books. Most churches offer VBS every summer. A week long program where kids can enjoy crafts, Bible stories, songs, and make new friends. Check with your local church. Yes, this can be a free activity too. If you have young ones, put them in a stroller and enjoy an air conditioned walk with fun scenery. Some malls have indoor playgrounds or even monthly kid's events. Simon Malls offer Kidgits Club. What summer would be complete without swimming? Depending on where you live there are all sorts of option. We personally spend $15 each year on a pass from Recreation.gov that gives us access to lots of day use areas at our local lake. If you're lucky enough to live near the coast then I'm sure you spend plenty of time at the beach. If you're more inland and not near a lake, then check with your local goverment for public pools or even check with your friends to see who has a pool membership. So whether it's Ocean, Lake, or Pool, swimming is always a fun way to spend the summer. 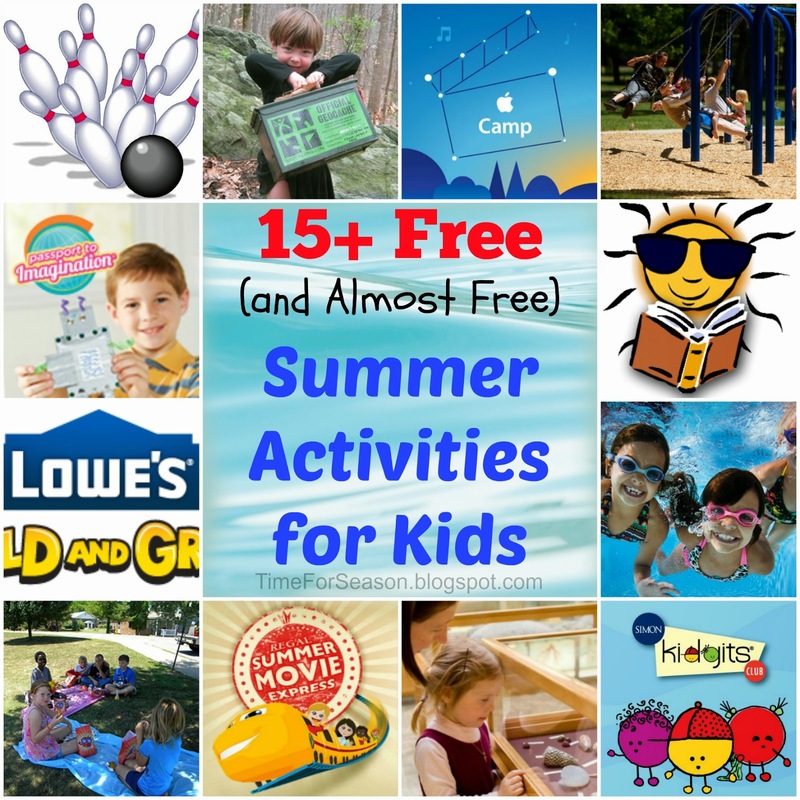 What fun activities will you be doing with your kids this summer?